A light aircraft on its way back from a Texas cattle sale crashed at a South Dakota wind farm in foggy weather, killing the pilot and the three passengers on board. The plane, which was registered to Donald J. “D.J.” Fischer of Gettysburg, was a single engine Piper 32 and was travelling from Hereford, Texas, to Gettysburg, South Dakota. The National Transportation Safety Board is investigating the South Dakota plane crash, but as yet no details have been released. 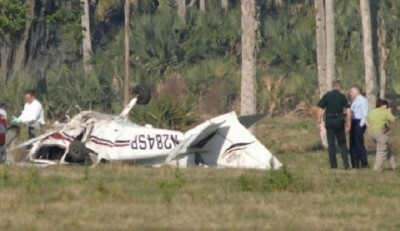 Nevertheless, the Luce Funeral Home confirmed to reporters that the pilot was 30-year-old Fischer. Lien Funeral Home confirmed the identities of two of the other three people on board, cattlemen Brent Beitelspacher, of Bowdle, and Logan Rau, of Java. The identity of the fourth victim is yet to be released. The pilot, Fischer, was a crop sprayer employed by Air Kraft Spraying Inc. who followed in his father’s footsteps and was heavily involved in the community. State Rep. Corey Brown, R- Gettysburg. a family friend of the Fischers, said the pilot had only married in March and was a volunteer emergency medical technician who was often out on calls. Authorities will now try to establish the cause of the fatal South Dakota plane crash.